Death Site Of Charles Arthur Floyd. My crew member Sarah took this pic in August. 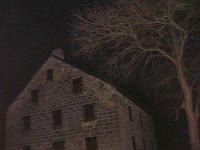 Blurry, yes, but the possible Female apparition up against Jon is a good indication that something might be there. Thompson Park in East Liverpool has an emerging Haunted Past that can make for an exciting evening. At the front gate there is the story of Marie. She was a woman who took care of the flowers in this area. 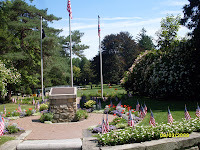 After she died, she left a large sum of money to the park so they would always be able to take proper care of this area. However, some believe she watches over the area as well. The Blue Lady roams all over the park, carrying her lantern in search of her lost children. And there is the ghostly presence at the pool house. This is Grimms Bridge. 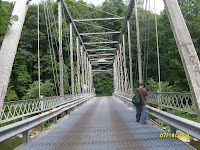 Many years ago a young man named Brian climbed to the top of the bridge and dove into the creek. He crashed into the large rock below and was killed instantly. There was also the story of a young woman who rode her horse across the bridge on her way to town, though she never made it. She was never seen again. The only thing found was her horses head. Now, at midnight during a full moon, you can some times catch a glimpse of Brian and this mysterious young woman dancing together on top of the bridge. EVP's we have done on the bridge have had some positive results in contacting Brian there. The old Williams house at Beaver Creek State Park may hold the ghost of owners passed. The Thomas Malone Covered bridge also has an somewhat cranky presence abiding there. This area requires permission to be there. Please check at the park office. 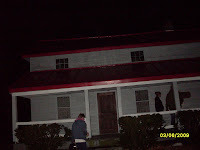 Very obviously, the Gretchen's Lock area is one of the most haunted areas in Columbiana County. The most famous ghosts here include Jake the Night Watchman, Gretchen, and Esther Hale. My crew and I have also talked to someone named Hannah, Sarah, Tommy, and John. Permission to be here after dark is also required. Check at the Park Office. 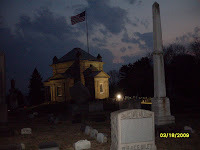 Hope Cemetery in Salem, Ohio has it share of ghostly stories and famous characters. The most notable is that of Goldie Bell Taylor. She died as a child and her grave marker is her likeness. The eyes on this statue are haunting. If you take her flowers, new ones mysteriously appear the next day. 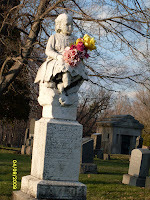 If you take her flowers down and stomp on them, the statue is said to cry. You need permission to be in here after dark. Check at the main office. Bowman Cemetery, nestled in the woods in the middle of nowhere, it's location alone makes it scary. Haunted by a witch that killed children, she lurks in the forest that frames the little grave yard. Remember, if you decide to venture into these areas, be sure to get the permission you need for each place. Respect the area and the entities you choose to interact with. Don't destroy the area, the grave stones, or the buildings in an attempt at provoking. You will get much farther with a respectful manner. You do want to make it back home, right?